Firestorm and the other heroes have been transported by Dr Fate to a rock in orbit above Orinda, the Manhunters’ home world. While the other heroes plan what to do next, Firestorm senses someone in need of help below the surface. As he flies off to investigate, Captain Atom accompanies him. There they find Harbinger and the Green Lantern Driq trying to escape from the traps the Manhunters have placed in their way. Found by the Manhunters, they attempt to regain control over Firestorm (as they had in FIRESTORM, THE NUCLEAR MAN #67 in Crossovers Week 1) but he sees through their lies. As the four heroes escape the planet and rejoin the other heroes, Orinda is destroyed. 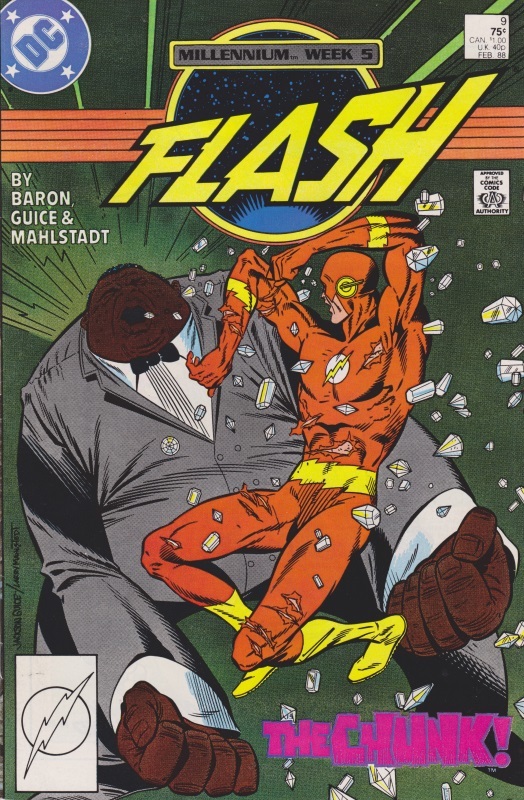 This is very much a red sky crossover; aside from a couple of mentions of the Flash’s father having been revealed as a Manhunter in FLASH #8 (as seen in Crossovers Week 1) there’s nothing to do with the MILLENNIUM storyline in this issue. Another tangential issue. As shown in MILLENNIUM #5, Wonder Woman disappeared from the Green Lantern Citadel while speaking with Arisia. Here it’s revealed Hermes transported her away, telling her Pan had been killed and replaced by a Manhunter duplicate. 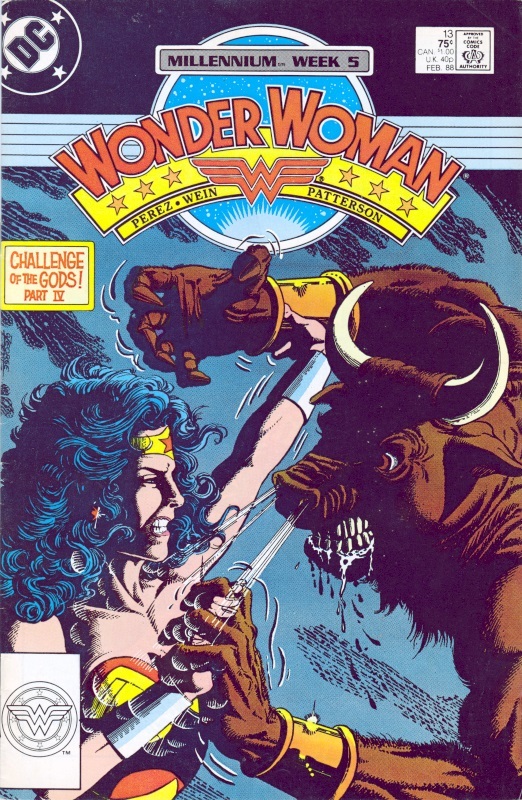 Wonder Woman meets with her mother Hippolyta and completes the challenges of the gods, but is approached at the end of the issue by Hermes who commands her to track down Pan’s duplicate and kill him. 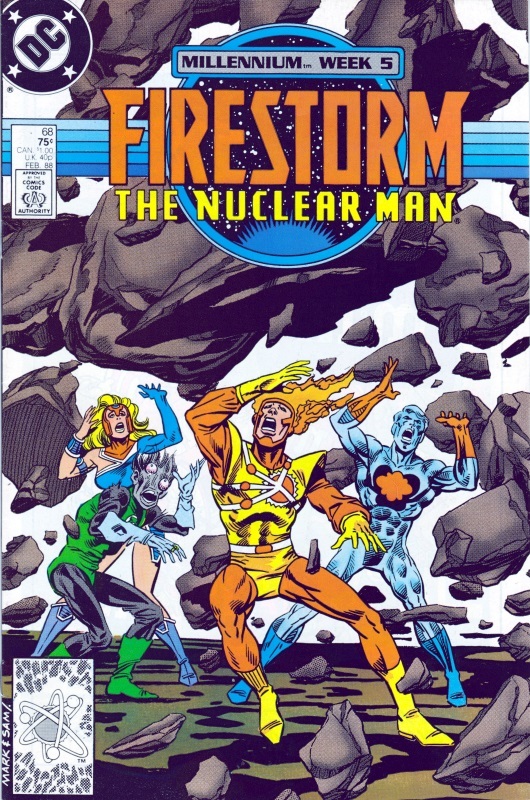 As shown in FIRESTORM, THE NUCLEAR MAN #68 detailed above, the heroes have found the Manhunter home world of Orinda and, while Firestorm and Captain Atom explore on their own, the rest of the team land on the surface before burrowing inside, revealing the entire world to be Manhunter-made. They find and destroy an assembly of Manhunters – as well as coming across the Green Lantern G’nort – before they find a birthing chamber overseen by the Highmaster of the Manhunters, a giant version of the androids. When Superman incinerates the newly created Manhunters, the Highmaster disconnects itself from the planet and leaves, planning to create a new world, telling the heroes that without it, Orinda will fall apart. 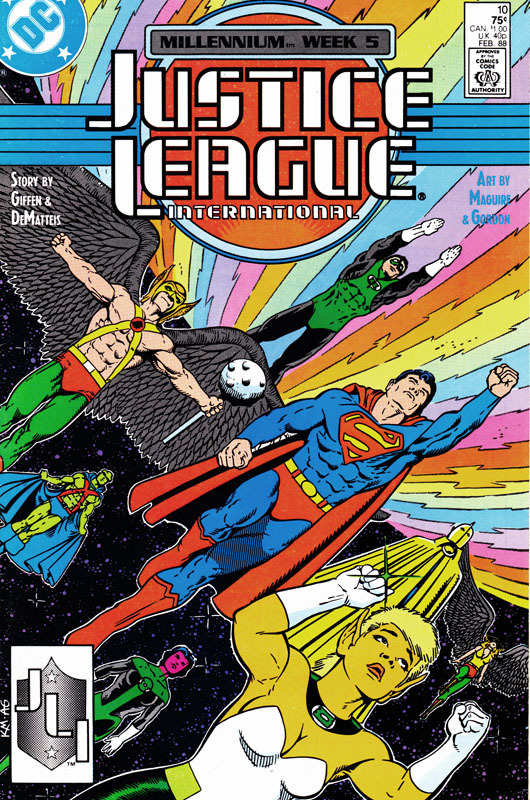 The heroes manage to escape the destruction and, as shown above, meet with Captain Atom and the others. Back on Earth, as Blue Beetle, Mr Miracle and Kilowog examine the space ship, a drone attacks Miracle but it is deactivated by Kilowog. 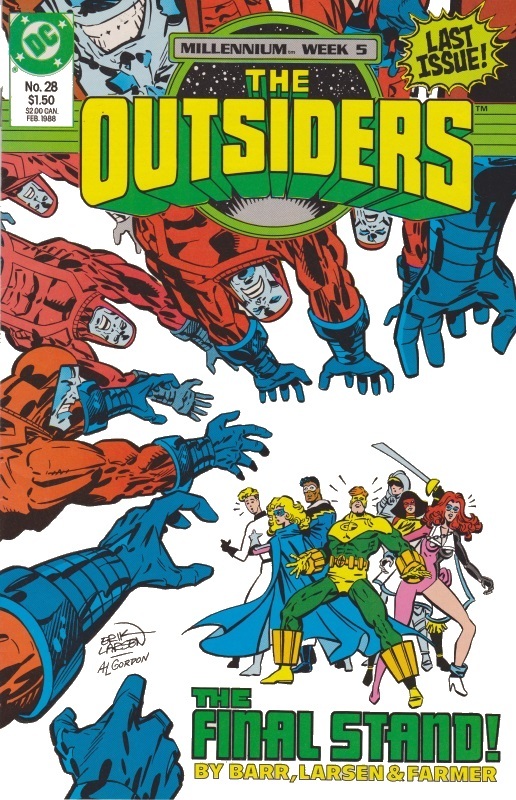 Teaming up with the Abyssian underground fighters, the Outsiders battle and defeat the Manhunters but at the cost of Looker losing her powers and Halo being struck comatose. Returning to Los Angeles, Geo-Force plans to inform the other heroes that the fight against the Manhunters must continue without them, as he disbands the Outsiders.